How do I add/delete a stock/option to my watchlists? How can I change my watchlist fields? 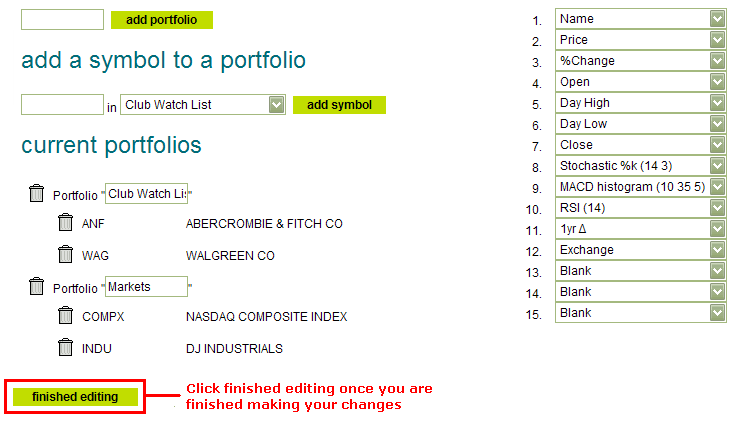 You can change your Watchlist column headings by clicking on the edit portfolios button on the bottom left of your watchlists. Once you are on the editing page, you can view which column headings you already use on the right of the page. 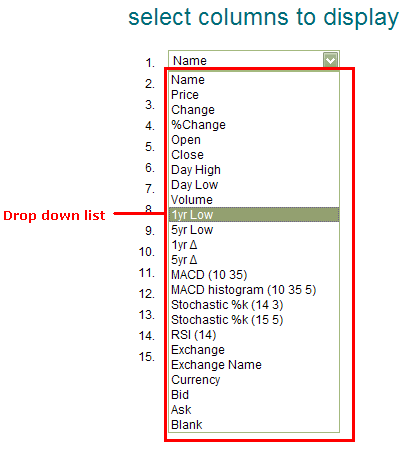 You can then decide which column headings to display on your watchlist tab by choosing from the drop down list. The list contains technical analysis indicators, such as, RSI indicator and MACD histogram. You can also view the Exchange the stock is traded on as well as the day opening price and the day close price. There are many other options to choose from. 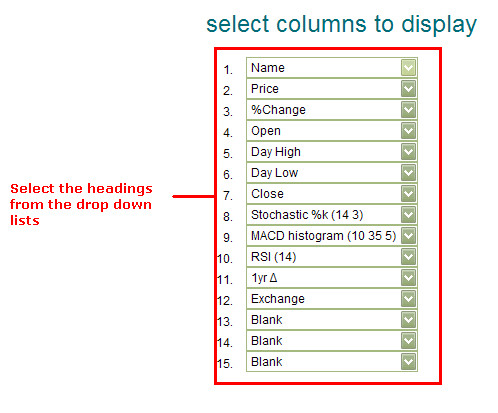 You have the option to have a number of columns, from 1 to 15. 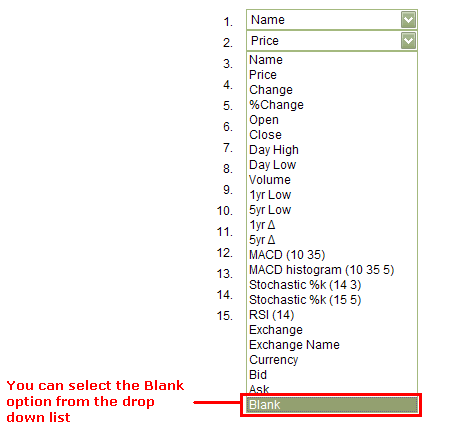 For those columns you wish to leave blank you can select blank from the drop down list. Once you have finished making changes to the columns, click on the finished editing button on the bottom left of the page. This will then return you to the watchlist tab. Stochastic %k (14,3) - The Stochastic %k value (green line in the Chart tab) based a daily interval period with %k equals 14 and a slowing period of 3. When the Stochastic %k value is under 20 the associated security is considered oversold. When the Stochastic %k value is greater than 80 the associated security is considered overbought. Stochastic %k (15 5) - The Stochastic %k value (green line in the Chart tab) based a daily interval period with %k equals 15 and a slowing period of 5. This Stochastic field is a slower version of the previous Stochastic field. When the Stochastic %k value is under 20 the associated security is considered oversold. When the Stochastic %k value is greater than 80 the associated security is considered overbought. MACD histogram (10 35 5) - The difference between the MACD 'green' and 'red' line values as displayed on the Chart tab based on a daily interval period with the leading moving average (ma) equal to 10, the trailing ma equal to 35 and the smoothing moving average equal to 5. When the MACD histogram is at or near zero it indicates that the MACD is at a crossover over point and therefore potentially reflecting a change in trend. MACD (10 35) - The value of the 'green' MACD line as displayed on the Chart tab based on a daily interval period with the leading moving average (ma) equal to 10, the trailing ma equal to 35. RSI (14) - The RSI value based on a daily interval period and an RSI period of 14. When the RSI is less than 30 the associated security is considered oversold. When the RSI is greater than 70, the associated security is consider overbought. 1yr Low - This field displays the lowest price that the security has closed at over the last year. 5yr Low - This field displays the lowest price that the security has traded at over the last five years. 1yr ∆ - The 'one year delta' field represents the difference between the current price of the stock and the lowest price that it has closed at over the last year as a percentage. When the value is at 0%, then the security is trading at the 1 year low value. If the value is 10% then it means that the current last trade price is 10% greater than the year low price. 5yr ∆ - The 'five year delta' field represents the difference between the current price of the stock and the lowest price that it has closed at over the last year as a percentage. When the value is at 0%, then the security is trading at the 5 year low value. If the value is 10% then it means that the current last trade price is 10% greater than the 5 year low price.